Bass guitars have featured prominently as of late and with good reason. Great examples like these by Rick Toone and Santiago Arteaga demonstrate inventiveness and ingenuity and serve as great inspiration. 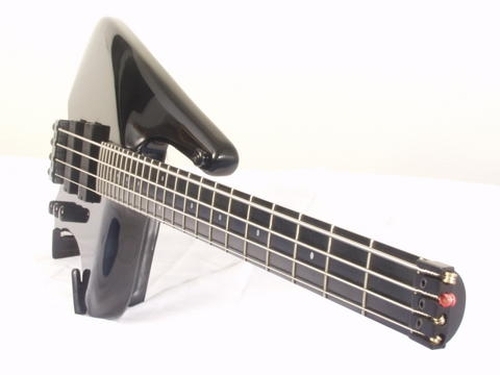 Now it’s time to look at yet another bass – Mats Erikson’s Klein KX-Bass inspired custom. The Plek system is very interesting. According to the site, “The Plek is a computer controlled machine tool that scans and dresses an instrument as it is, strung and tuned to pitch”. The result is a neck with low action and that free of buzzing. A “papier-mÃ¢chÃ©” guide model was molded around my stomach. The bass is made comfortable for me only. Tall people report having problems sitting down with it. I am a short, slightly tubby person. It fits me perfectly and wraps snugly around my belly! I can’t gain weight or lose weight too much then it won’t be/feel as comfortable! You can’t beat that level of customization! It differs from the original Klein KX-bass a lot, in that it’s missing the ridge that has been carved out on the right arm elbow part. This body has only a rounded spherical contour as shown in one of the pictures. The EMG pickups are connected with DIRECT COUPLING method, which mean they are set to one height only and almost squeezed into their cavities and screwed snugly and tightly to the bottom. EMGs pickups should be as close to strings as possible, so there was no need for having any adjustable option. This increases sustain and the body’s vibrations spills over into the magnets inside the pickups. All sides of the pickups, but the front, have close connections with body wood, and the cavities have no shielding paint, or paint at all. The change from ABM to Steinberger bridge has made me think about lowering the neck-to body-angle a bit, since the Steinberger bridge is a bit sleeker and slim. It makes the string seats have to be set very high in order to stay clear of the un-adjustable pickups almost leaving no room for intonation. Many thanks to Mats Erikson for sharing his Klein KX-Bass. Sorry for commenting on my own bass. Thanks for posting it. I have to add, that the combination of Swamp Ash wood PLUS the Direct Coupling fastening method of the pickups, SEEMS to be a tiny bit ill-fated. Just a tiny bit. Such a vibrant wood translates vibrations into the pickups, for sure, but the screws which holds the pickups are very prone to self-unwind after a while, due to that they’re quite hard stuck and screwed into quite soft wood that are not capable of holding small screws like that on its own for any long period of time. A threaded steel insert would probably do wonders, OR changing the wood of the body, to a harder one. But a harder wood wouldn’t vibrate into the pickups as much and then leaves the Direct Coupling method futile. A threaded steel insert MAY not be able allow the screws to get the pickups to fit snugly. Also, this softer wood, makes pickups easier to lift out from their cavities, since the wood naturally wears with time. With harder wood they might get stuck in there forever! There IS a very significant tone change between in having the pickups Direct Coupled and hanging free just on the screws and their springs. Everyone I know can hear it, not just by playing the bass. Also – but I have no scientific evidence on this – some people says that the magnets inside the pups can be hold still, more when surrounded with stabilizing material. I think this varies with each and every pickup though. If they’re waxed inside there’s not pretty much room for anything to move around, even still, transmit vibrations from any wood surrounding them. One can’t cram them in from their short sides as that’s where the screw ears goes. 1. How far should you go in terms of ergonomics, provided that it has inferior impact on sonic qualities? 2. How far would you go in terms of WORSENING ergonomics in order to gain sonic benefits? Say, dodge headstock to remove dead spots. Body design vs less/more sustain. Scale lenght’s to provide easier finger access, vs long scale length, greater tone (bass guitars). Fixing pickups the Direct Coupling way, but the trade off is pickup height adjustment and swapping out. And so on. Just an example. Is there a line at all? I think electric instruments has a wider margin than acoustics though. You might want to drop Todd Keehn a note: http://www.tkinstruments.com He’s big on direct mount pick-ups too. Thank you Ray and Alex. Todd Keehn seems to be the only one on the net, to which I agree on 100 percent on everything when building guitar. Especially his view on radiused necks, SS frets, large frets, fanned frets, etc. So his views on direct mount pickups are also within my lines. However, it seems that he’s not that keen on (hrrm…pardon, the bad pun I couldn’t help myself) carrying on building guitars or basses at present. There seems to be too many people wishing to have this and that customized or whatever. It seems that he builds them the way he wants and then the people have just to take it or leave it. Sorry, I’ve not replied earlier. Discovered this just today. We just did look at all photos on the web that we could find. And tried to make it after that. There’s only a template or plan of the Klein Harp GUITAR (the one made for Michael Hedges) obtainable from Guild of American Luthiers. No bass at all. I do not intend to make a plan or template of it either. In Italy is hard to find anything like that. I find it peculiar that the most interest in a Klein, both bass and guitar, of all European countries, seems to be in Italy. Not bad in any way, just positive, but I mean, UK or German interest is practically nil, they got their Status basses and guitars instead. 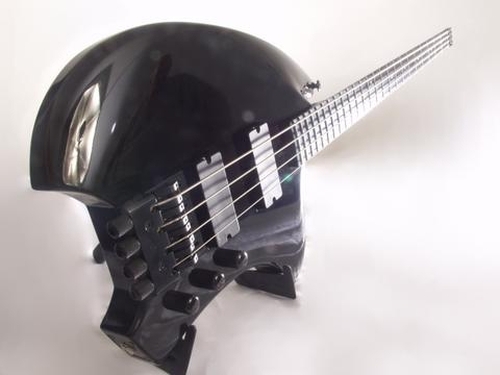 And Germanys BassLab are making outrageous headless designs instead. 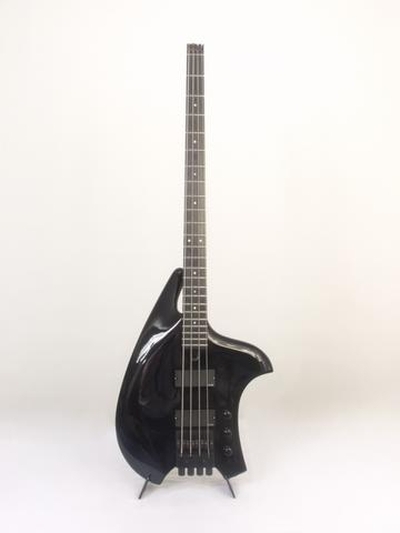 While I have seen numerous Klein guitars up on for sale on e-bay or elsewhere now and then, I have yet to see a real Klein KX-bass, I wonder how many there are out there that was really made and sold. It’s definitely not above 2 digit numbers. ok, I’l do my custom template… but I’ve read that strange Plek stuff… what did you do? Did you ship the instrument in order to make the computer controlled adjustment? Yes, I was about to send it to Berlin where the original Plek shop exists. But they opened up a shop in Stockholm which is 6 hours drive from where I live. So I’ll better send the gear up to them. They had my bass as a GUINEA PIG – test example item – when they first set up the machine. They had problems initially due to the non-uniform body, but now they’re as professional as any. Read about the Plek thing for yourself on http://www.plek.com. Basically, if your frets are new and ok, don’t bother, but if they need any leveling or adjustment due to fret wear, you might as well spend the extra money on having it “plekked”. If you have the strings too low on a Plek guitar/bass you almost can get sitar tones all over the neck, because they’re that precise. However, this low action is not recommended. But they wont ever get my original Klein, it ain’t needed. Also, they check the guitar first to see if there’s any need – really – for a plek, and if the machine says the frets are alright anyway, they won’t scam you and charge you for money. So, some guitars don’t really need a Plek at all. Don’t know really. Peter Clemmedson of JG Guitars just put the slab of papier mache on my belly and we went from there. What kind of wood he used after that, or how big it was I don’t really know. I was only doing all minor, tedious jobs, sanding, buffing and filing, he did all the tidbits first. I screwed it together, but he shoot and lacquered it in a spray boot. Took half a year on and off. Large inactivity between woodworking sessions. You know, it wouldn’t make sense really to tell you the final measurements even. They wont fit you anyway. I am not the sole builder of this bass, I am sorry if it came across like that. I am not a builder at all. Really. I have absolutely no knowledge of woodworking, or paint, of what to use, how to do it and whatever. I just design it and make final improvements and electronic assembly perhaps.